In April, during a visit to the Armed Forces Western Command (WesCom) in Palawan, the province closest to the disputed islands, President Rodrigo Duterte was briefed on the contentious state of affairs in the South China Sea, including which islands and reefs were occupied by the Philippines, China, Vietnam, and Malaysia. In a conference room in the new WesCom headquarters, he was shown slides of maps and the islands, color-coded depending on the country that controlled them, as well as the structures and military installations on each of them. Defense Secretary Delfin Lorenza, among other top security officials, accompanied the President. What happened here? It is hard to find any explanation other than that Duterte didn’t get it. Apparently, the fact that 9 islands had been under Philippine control, 8 of them since the 1970s, and the last one since 1999, escaped the mind of the President. Each of the features hoists a Philippine flag and various structures have been erected, the most extensive of which are in Pag-asa, the most populated island in the municipality of Kalayaan in Palawan. This appears to be a simple case of lack of comprehension. But, in the first year of his presidency, this is the most benign instance of Duterte’s limited mental capacity. There are other examples where he shows that he is either under-informed or that new information slides off his mind, resulting in decision-making that is without rigor. Overall, it’s been a year of living with an incapable leader who has cloaked himself in autocracy. His incompetence is masked by lots of bravado, using violent language, threats, and stinging curses. He fuels his rule with fear, a cover for his inadequacies. These distract us from his true worth as a leader. Foreign commentators have criticized Duterte’s splintered attention, zeroing in on drugs at the expense of terrorism, and his seeming lack of coherence on two vital fronts, the war on drugs and the diplomatic battle against China, “leaving the country deeply confused and divided.” They are not far off the mark. His first year in office shows that Duterte’s experience as mayor is vastly out of proportion to the demands of the presidency. And it has ill-prepared him for the checks and balances that are central to a democracy. Shaped by decades of ruling Davao as the uncontested mayor, he has little regard for co-equal bodies. Remember that he threatened to declare martial law when the Supreme Court chief justice, Maria Lourdes Sereno, cautioned him on his unrelenting drug war. And woe to any institution or person who challenges his views. He fired the head of the Dangerous Drugs Board for sticking to a lower figure of drug users, 1.8 million, which is based on a 2016 scientific survey, in contrast to Duterte’s 4 million, taken out of thin air. He calls his critics names and is unable to engage in a civilized debate – “Daldal ng daldal…wala namang ginawa… (He keeps yakking but he hasn’t done anything)” is how he responded to Justice Antonio Carpio’s push to assert Philippine sovereignty over islands in our exclusive economic zone. What is most disturbing, so far, is that he has used the power of the state to send a critic to jail on feeble charges. It’s been about 4 months since Senator Leila de Lima has been detained. Duterte believes he is often right, disregarding consulting with his Cabinet members on vital issues ranging from the declaration of martial law – he made the decision without meeting with his defense secretary – to mining policy. The President did not convene his socio-economic team to provide strategic direction in this crucial sector. It was only after Environment Secretary Gina Lopez suspended operations of several mining companies, creating an uproar in the industry, did the Cabinet meet to clarify the policy. Simple solutions are his responses to complex problems, like the magic wand of martial law and killing of drug users, thinking that these will make the problems go away. He still hasn’t caught up with the scale of ruling a country, unimaginably far from the “kanto-kanto” (his words) of Davao he used to patrol on motorbike at dark. Take the drug war, his centerpiece program. Despite evidence showing that curbing drug abuse is not simply a matter of using force but is tied to social issues, Duterte has continued with his policy to exterminate users. He is unable to link drugs to poverty and the feeling of exclusion, poor governance, and unresponsive public health programs. In foreign policy, he shows a similar limited understanding of the issues. For example, after the boost given by the country’s overwhelming victory over China in July 2016, Duterte sees war with our giant neighbor as the only way to enforce the ruling. He has repeatedly said that the Philippines cannot afford to go to war with China, dismissing outright peaceful avenues. As experts have pointed out, there are a number of diplomatic options in the President’s arsenal, including strengthening alliances with claimant countries as well as allies to put pressure on China and creating a marine park in parts of the South China Sea to preserve the fishery resources and protect the environment. Duterte’s narrow mindset came to the fore again when he said the root of the crisis in Marawi, where Maute violently seized parts of the city, was the drug money boosting the criminal group. “…Ang puno’t dulo diyan is droga kasi diyan ang hotbed ng shabu pati drug sa Mindanao (This is rooted in drugs because Mindanao is the hotbed of shabu),” he told soldiers in Sulu. While this may be partly true, the problem is not one-dimensional. Systemic problems, such as weak governance, poverty, and dysfunctional courts and prisons, have made groups like Maute thrive. Duterte’s solution was to declare martial law in Mindanao. Again, this is only one tool in his kit. Will it fix the problem of terrorism? 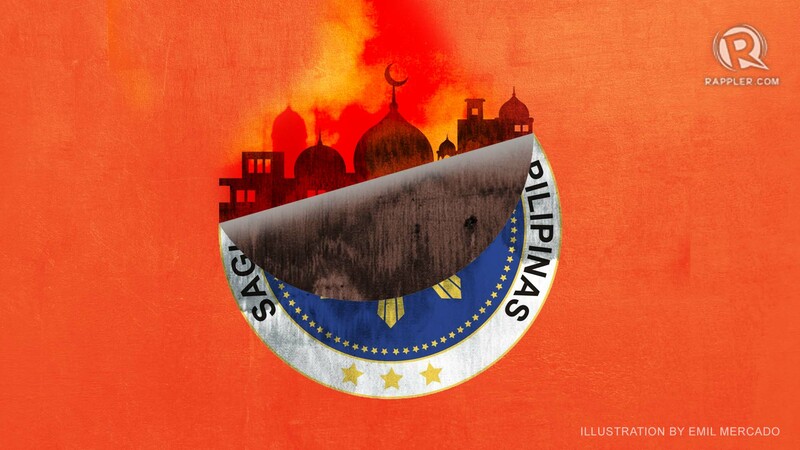 The country’s experience – 14 years of martial law under President Ferdinand Marcos and one week of martial law in Maguindanao under President Gloria Arroyo – has shown that it will not. Till today, we’re still living with a communist insurgency, a Muslim rebellion, terrorism, and lawlessness and feudal politics. From the drug war to foreign policy to terrorism, Duterte wings it, propped up by his aggressive propaganda campaign on social media and elsewhere. This PR machine – plus the survey ratings that show him still enjoying public support – may lull him into a false sense of complacency. Past surveys show, though, that presidents usually get good ratings in their first year in office as the populace unites behind them.